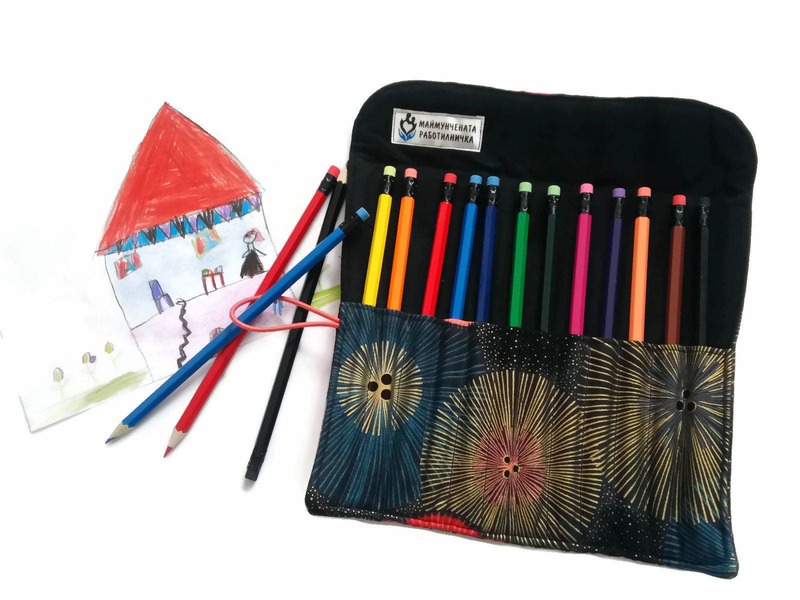 Fabric Pencil Rolll Case would make a wonderful gift for both - children and adults - who loves drawing and coloring, or a perfect gift just for you. This Pencil Holder provides a creative way to store and organize your colored pencils and it is great for travel too, whether you are (in the car, on a plane, train or boat). This pencil roll is made entirety of cotton fabrics and it’s lightly padded for durability and protection. The top fabric has light golden glare. The covered button completes the elastic closure to keep your pencils safely wrapped. There is also a top flap that folds down over your pencils to help protect them and hold them in place. NOTE: When you purchase this listing you will receive 12 Colored pencils (which are displayed on the pictures) as a GIFT! This pencil roll can holds 12 colored pencils (1 pencil in each slot), skinny markers, pens, paint brushes, or various other art media that you may have. Pockets will hold items at an approximate height of 7.48 inches (19 sm.) or shorter. Approximate dimensions – 9.84 x 8.27 inches (25 x 21 sm.) when it’s open and 9.84 x 1.97 inches (25 x 5 sm.) when it’s rolled up. Machine washable at 86 F (30 C) degrees on a gentle cycle with no spin. Lay flat to dry and press as required.Do not machine dry. Do not bleach. This Pencil holder roll has been designed and handcrafted by myself in my smoke free and pet fee home studio with great attention and care. Please Note: Pattern placement and buttons can vary slightly from the photo shown, because each item is made from different parts of the same fabric. My items can be customized to meet your specific requirements, so please contact me with any particular requests you may have. If there is any more information you need - please just ask!